Because of its convenience in shopping and presenting, the number of gift vouchers purchased has increased dramatically recently. However, its convenience when shopping sometimes causes annoyance as anyone with the gift codes can use them to redeem when checking out. That is the reason why Mageplaza Gift Card extension allows cards’ owners to manage their codes by sending SMS notifications about every shopping activity with the certificate. First, admins need to turn on SMS notification by selecting Yes in Enable SMS Delivery. If you forget to do that, customers when purchasing gift vouchers cannot use this function for their gift codes. After that, fill in Twilio Account SID and Twilio Account Token. In case you do not have any Twilio account, register here since this function can not perform without having a Twilio account. Next, entering Sender Phone Number to confirm the number that will deliver all messages on behalf of your store. If you do not own any phone number, refer here to buy and get one for your business. The next step you have to do is forming template for your messages which are going to sent to customers. There are up to seven variables for you to get them included in the message such as Sender Name, Gift Card Code, Gift Card Message, Gift Card Balance, Gift Card Status, Gift Card expiration date, and Store Url. If you want to attach any information into the message, follow instructions below the field box to fill in the box. For example, if you expect the Sender Name, Code, Message, and Store Url to appear in the message, you can configure as following: sent you a gift card `.`. Visit to use it. Remember that you can arrange these variables totally depend on your preferences. Beside notification about gift card when it is purchased as a gift from the sender to the recipient, shop admins can decide to send SMS notification to card’s owner whenever they make changes to the card like redeeming cards. To turn on this function, choose Yes in Enable field from Gift Card Update Notification. Also, in SMS message, admins can make a template for all messages sent by adding variables in the template. For example: Your gift card has been updated. Visit to check it. Last but not least, store owners can remind cards’ owners of expiration date of their cards via SMS also. To enable this function, remember to select Yes in Before Expired Notification. After that, make a format for all the messages by inserting variables like these two message templates above. 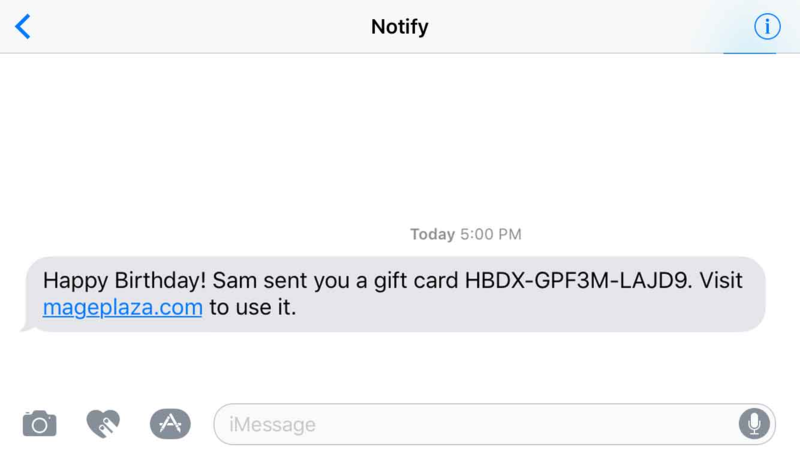 In frontend display, only when buyers decide to send their gift certificate for their beloveds via text message, can recipients receive gift card codes via SMS notification. Look at the screenshot below to see a SMS sample sent to a recipient. When recipients already receive their gift codes from senders, they can turn on notification via SMS for every shopping activity by navigating My Gift Card. In the product page, access notification settings. In this field, customers can tick on Gift Card Update Notification and Update Balance Notification to mark them as chosen.